St. Petersburg is much more than just a vibrant city: it’s a never-ending feast. From its wide avenues to its ornate remnants from its Imperial past, Russia’s Venice of the North never fails to impress. If you dream of coming St. Petersburg, check our shortlist of St. Petersburg’s best annual events. If you are planning your summer holiday, then this is the perfect time to contemplate the spectacular royal heritage of the city and learn of the many events and festivals taking place during the warmest months of the year. Here’s our shortlist of St. Petersburg’s events worth visiting. One of the best ways to greet summer in St. Petersburg is to attend the traditional opening festival of the fountains in Peterhof. It takes place in mid-May and on this day the entire collection of the Russian “Versailles” goes live. Each fountain is turned on one by one accompanied by musical performances, fireworks and celebrations. 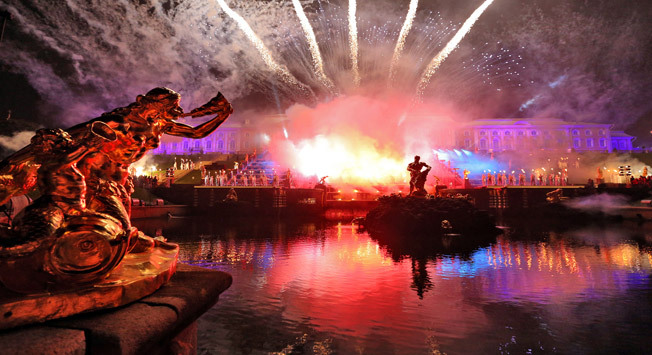 The best part about Peterhof’s fountain season is that there is also an official closing party held in September. So, you have two great opportunities to enjoy the spectacular views of the Grand Cascade and the Grand Palace. Around the same time that Peterhof celebrates the opening of the fountain season, St. Petersburg traditionally hosts a very peculiar event: the Festival of Smelt. Not the prettiest sounding fish on Earth, all the same smelt is the unofficial symbol of the city, which Peter the Great called “The Tsar’s Fish.” The first such festival was held in 1708, but the tradition went dormant for many years. It was revived in 2003 when St. Petersburg celebrated its 300-year anniversary and today the Smelt Festival attracts thousands of guests to the famous LENEXPO exhibition center. Over two days you will have an opportunity to feast on all kinds of dishes cooked with this legendary, yet simple fish from soups to main courses to salads. Listed among the 10 best classical music events in the world today, The Stars of the White Nights festival is an absolute must even if you’re not an opera and ballet aficionado. Founded by Valery Gergiev, the director of the renowned Mariinsky Theater, this festival gathers outstanding artists to share their talent and perform classic masterpieces composed by everyone from Sergei Prokofiev to Ludwig van Beethoven to Gustav Mahler. In addition to classic theater performances on the Mariinsky’s stage, there are numerous outdoor events around the city that fill the air with the spirit of the world’s best performers. Probably one of brightest events of summer here is the Scarlet Sails boat parade. Though today this celebration is closely associated with the end of the school year, the history of this event is deeply rooted in Russia’s pre-revolutionary past. The fairy tale “Alye Parusa” (The Scarlet Sails) is probably the best-known work of Russian romantic writer Alexander Grin. This fairy tale takes place in a fictional land and tells the story of a young girl named Assol. It has been predicted that she would meet a prince, her one true love. According to the prediction, the prince was supposed to arrive on a ship with scarlet sails. By the end of the story, a wealthy captain falls in love with Assol and learns of her story. He docks his ship with scarlet sails and makes Assol’s dreams come true. The modern festival was first held in 2005 and since then has become a much-anticipated annual celebration. Following a live open-air concert in the heart of the city, a beautiful parade of vessels sails along the banks of the Neva River to the sounds of classical music and fireworks. The boat parade is led by the fairy-tale ship “The Secret,” decked out with scarlet sails much like in Grin’s story. St. Petersburg is one of the world’s most beautiful cities, and deservedly so. Plan your St. Petersburg vacation during the warm summer months and enjoy dozens of smaller events held here from May to September. About the author: Slava Shirokov is a Russian native, keen traveler and CEO at Travel All Russia, a destination management company specializing in premium tours to Russia.